Photo Credit: Barrel racing action continued at the Washington International Horse Show. Photo by Alex Thomas. This photo may be used free of charge only in relation to this press release. Washington, D.C. – October 26, 2006 – What could be more exciting than watching the world’s best show jumpers bound over 5’6" fences? Why, watching the best show jumping athletes trying to barrel race against some of the top athletes that the women’s Professional Barrel Racing Association has to offer, of course. It was EMO/Berkley Underwriting Partners Night at the WIHS, and the crowd loved the action that the Barrel Racers provided. Barrel racing is a timed event where the fastest time is what matters most, and cowgirls compete in the arena against each other and the clock. Three barrels are set up at different marked locations, and the riders enter the arena at full speed, quickly rounding each barrel and then exiting where they entered. A timer is used, which registers down to a hundredth of a second. For each barrel they knock over, a five second penalty is assessed to the total time. The barrel racing exhibition included the top four talented women from the night’s competition. Some of the leading ladies from the Women’s Professional Rodeo Association, American Professional Rodeo Association, National Barrel Horse Association, and the J-W Ranch Barrel Series raced against one another, with the top four competing in an additional run against four show jumpers mounted on barrel racing horses. The event was a crowd favorite, and the show jumping enthusiasts enjoyed seeing equestrian athletes compete in a discipline different from their own. The serious side of competition was lightened when the show jumping athletes joined in the fun. Although they are top athletes in their disciplines, they never get to practice barrel racing and the awkwardness of using different equipment and riding aids can be comical. The Washington International Horse Show crowd cheered on the leading ladies of barrel racing and the jumpers in this special event. Candice King, one of our country’s top grand prix show jumpers, had the fastest time but had two barrels down, which added ten seconds for a total score of 26.01 seconds. Grand prix show jumper Todd Minikus looked at home on his barrel racer and had a very fast time of 16.77. Harry Smolders from the Netherlands had one barrel down, scoring 22.50, and Aaron Vale had the winning time of 16.41. When the Ladies Barrel racing scores were added to their Grand Prix partners, the winner was Todd Minikus. Minikus got to bring home a check for $500 and had bragging rights over his grand prix competitor Vale. "This class is great," Minikus said. "It breaks up the seriousness of the competitive week here at Washington. It is fun to just run flat out like that," he laughed. 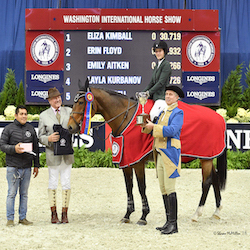 The 2007 Washington International Horse Show (WIHS) serves as one of the country’s most prestigious and competitive indoor equestrian events, with prominent riders, Olympic veterans, and superstar equines competing for top honors and fabulous prize money. The WIHS, held October 24 - 29, 2006, is located at the Verizon Center in Washington, D.C., home of the Washington International Horse Show since 2000. There will be many exciting events to come, including the $100,000 President’s Cup Grand Prix on Saturday evening, and $25,000 Puissance, which was held on Friday night.